The horse fence wire configuration is designed to prevent horses, cows and other hoofed animals from stepping through the wire. A tight 2”x 4” wire spacing is used to ensure the safety of the animal by preventing injuries and protecting against predators. 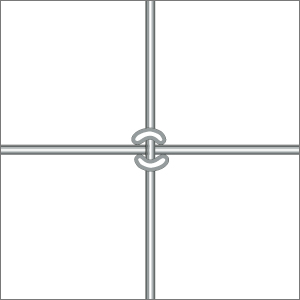 The “S” knot design uses a separate piece of wire that attaches the line wire to the solid stay wire assuring maximum strength and prevents the fence from buckling or sagging. This design is smooth to the touch so you won’t have to worry about injuries to your animals. The knot’s strength holds up to even the strongest impact while maintaining flexibility. Our horse fence inventory consists of a variety of wires from Bekaert, Keystone and Deacero. V-mesh horse fencing is made with close, diamond-shaped spacing to keep predators out and prevent hooves and legs from getting caught in the fence. V-mesh is strong and flexible and is made of quality galvanized wire.